Hookedblog were recently over in Walthamstow in East London catching up on the work of our friends at Wood Street Walls (Previously on Hookedblog). As we have been away travelling we missed a number of the newer mural projects they have arranging in their neighbourhood and a visit was long overdue. One of the new murals we photographed while in Walthamstow was that of ATMA’s, a Blackhorse Road resident and a founding artist of Wood Street Walls Project. 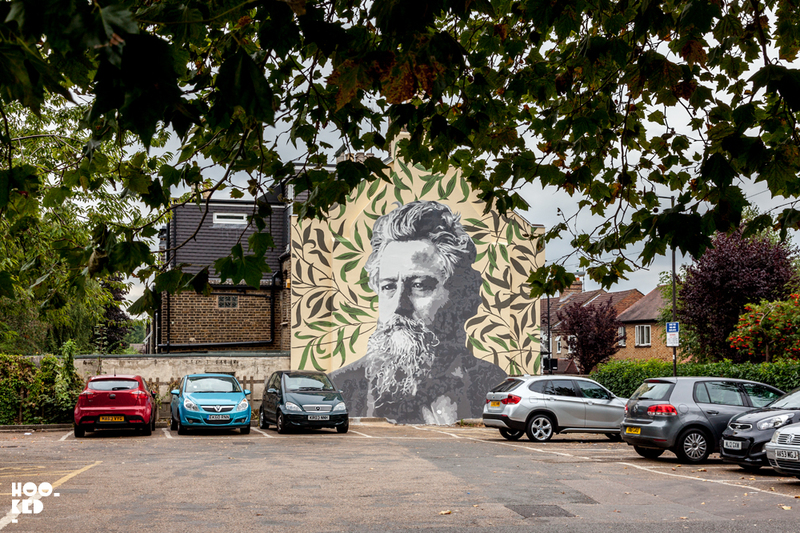 The artist's mural painted on the gable end wall on Bedford Road features a stencil portrait of the English textile designer and socialist activist William Morris. A one time Walthamstow resident Morris’s family home now houses the William Morris Gallery which is located next to this new mural from ATMA. 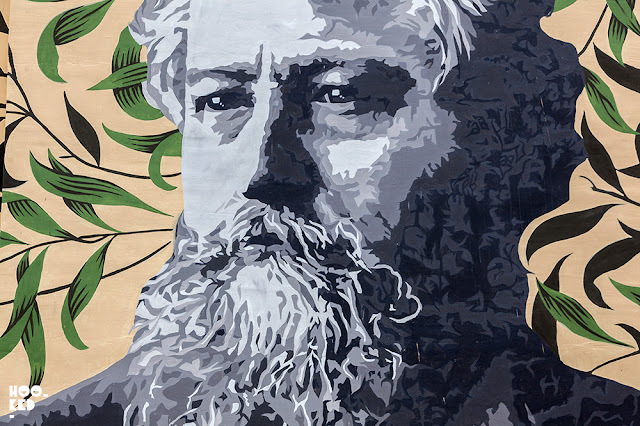 For this project organiser Wood Street Walls and William Morris Big Local enlisted the help of the local HEET society. Also based in Walthamstow, HEET helps the elderly and those on lower incomes save money on their fuel bills by improving the energy efficiency of their homes. The wall on which the mural was painted was fully insulated by Heet prior to ATM painting his mural.was fully insulated by HEET before ATMA began work on his mural. The local residents were also invited to contribute by way of a vote on how the final mural would look. Local were able to choose between six different William Morris patterns to sit behind the portrait, with the pattern getting the most votes being what was painted by ATMA on the finished mural. The William Morris Mural is located on Bedford Road, Walthamstow in the car park opposite the William Morris Gallery. If you head over to Walthamstow to visit the mural we suggest you also visit the excellent William Morris Gallery where you can learn more about this famous local and the British Arts and Crafts Movement.